Create a unified look along a fence or wall with these Panacea Black Forged Vine Brackets. This set of 4, sturdy steel brackets makes displaying hanging items simple throughout your home or yard. A small scroll beneath the arch on each of these units evokes a tendril or grapevine, while the body of the bracket extends outward and accommodates your wind chimes or bird feeder. Attach the base of each unit to a wall or post using the included screws, to showcase a 23" diameter or smaller adornment. The square bar construction of each hanger contrasts the curling accents, while their black, powder coated finish provides protection from the elements. 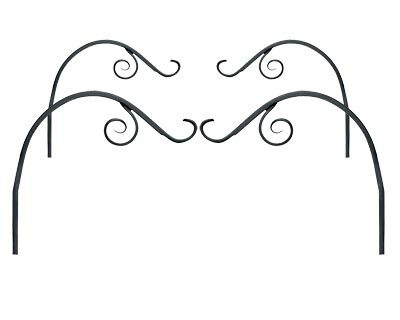 Hang your outdoor decorations easily and with style using these Black Forged Vine Brackets. Note: This case pack includes 4 of the Panacea Forged Vine Brackets, Black, 12".